Jaspal Chadha took the image from his backyard in London in April 2015. 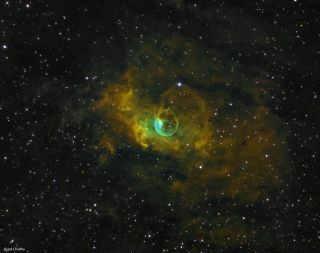 The vivid colors of the Bubble Nebula shine in this green and yellow image. Jaspal Chadha took the image from his backyard in London in April 2015 and recently shared it with Space.com. To take the image Chadha used a Takahashi 130 telescope, with a qsi 690 ccd camera on a ioptron cem60 mount. In 2015, Chadha also shared this different view of the Bubble Nebula that was just as amazing. Approximately 6 light-years wide, the bubble nebula, also called NGC 7635, is located roughly 7,100 light-years from Earth in the constellation Cassiopeia. A light-year is the distance light travels in one year, or about 6 trillion miles (10 trillion kilometers). The bubble was created by fierce stellar winds and intense radiation from a nearby star, which likely has a mass 10 to 20 times that of the sun. The process blasted out material to form the bubble structure of glowing gas against denser material in a surrounding molecular cloud. The cloud contains the expansion of the Bubble Nebula while itself being excited by the hot central star, causing it to glow. Chadha took his frames to create the composite image using three different filters to capture gases that convert to colors the eye can see. The final image depicts red light from hydrogen atoms as green, red light from sulfur ions (sulfur atoms with one electron removed) as red, and green light from doubly-ionized oxygen (oxygen atoms with two electrons missing) as blue. These color reassignments enhance the level of detail visible in the image, which makes the light from different gases easier to see and creates the vivid image. You can see more amazing night sky photos by our readers in our astrophotography archive here. Editor's note: If you have an amazing night sky photo you'd like to share with us and our news partners for a possible story or image gallery, please contact managing editor Tariq Malik at spacephotos@space.com. Follow us on Twitter @Spacedotcom. We're also on Facebook & Google+. Original story on Space.com.